Captain Picard and my friend are alike in many ways, as this picture attests. He shares something with Capt. Kirk too, now that I think of it. John was more than a breath of fresh air to this company. He and the team he brought in were CPR. ABC was in a bad place. It needed major change. Customers were exodus-ing (yes, I made that word up). Those who stayed were frustrated. Competitors were gaining ground. Dogs and cats were living together. It was mass hysteria. Over the years John lead this company, it was like the sun coming out after a 40-day rain. Customers returned. The future looked bright. And a new respect was garnered. Serve those you lead. John was a paragon of “servant leadership.” He did not have any airs of being “Mr. Big.” You never felt he was looking down at you. And he wasn’t afraid to get on the ground (literally in some cases) to get his hands dirty when helping those whom he lead. I remember seeing him at a trade show once, on the floor, picking up all the trade show booth stuff, rolling up carpets, and stacking boxes. Something you rarely see the CEO of a large company doing. Surround yourself with excellence. Every great leader knows that a “ship” cannot run by itself. Where would Kirk be without his Spock? 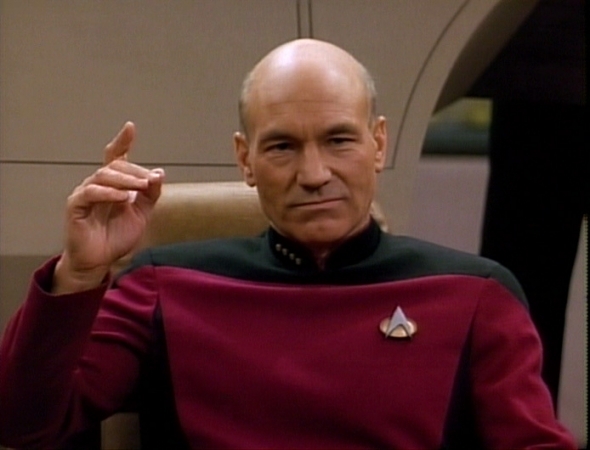 Picard without his Riker? John recruited a top-notch management team, good leaders in their own right. Empower those you lead. You can’t just recruit a great team. You gotta give them the power to do their jobs to the best of their ability. John was great at empowering those around him to do just that. He then stood out of their way to let them do what they do best. Take responsibility. Give away the credit. Not everything John did came up roses. There were some bumps along the way. But he was always the first one to take responsibility. He wasn’t a “pass the buck” kind of guy. (Note to you who hire contractors. If they goof, don’t tell your client “It was the contractor’s fault.” The buck stops with you). On the flip side, John was always quick to give credit for ABC’s successes to his team. I was in an office recently that had a great quote on the wall. “There’s no limit to how far a person can go in life when they don’t care who gets the credit.” This was John. Ignore the Debbie-downers. But listen to their comments. ABC had a lot of naysayers. Not the least of which some of its own customers. When John took over, he got his fair share of an earful. There was also the consistent public attacks from others outside the company who for whatever reason held strong negative opinions about ABC. John didn’t bother letting those get to him, and as far as I know, he seldom (if ever) publicly engaged those people. There will come many times in your life when you will have to deal with people who don’t like you or your company. Some will bring constructive criticism. Some, like internet Trolls, will just blast you. Be the bigger person. Don’t stoop to their level. As much as possible, ignore the ones who just want to stir stuff up. But, be open to ALL criticism as having some shred of truth. Be willing to look introspectively. Be accessible. Be real. “Engage”. John did something I’ve never seen a CEO do. He gave out his cell phone number. His real cell phone number. And he was active in communicating directly to his customers. And in the communication, you knew every ounce of him was real and authentic. It instilled trust. Embrace change. John had to make a lot of changes when he took over. Change can be hard. But change is necessary for a company to grow and prosper. As is sometimes the case in business, change requires change of leadership, and at some point, all good things must come to an end.That’s just the way the ball bounces. I think this particular change may be good for John as I know the job was taking a lot of time from family. But he leaves a legacy of leadership that will be challenging for the next guy to follow. John inspired those under him to rise to any occasion, and to go above and beyond; to boldly go where they had never gone before. I truly believe many who follow him would take a bullet for him. No lie. I wish you all the best my friend. May you continue to inspire and lead.